I am teaching Introduction to Programming for Information Professionals, online, for the University of Maryland this semester. My colleague, Bill Kules, has taught this class (in person) several times and has included social justice/critical perspectives aspects in at least one prior semester (docx). We talked about including it in each of our sections of this semester’s course, and, obviously, I was enthusiastic about the idea. It’s worth mentioning that Bill wasn’t the first person I’d heard of, combining the teaching of practical coding skills with readings about technology’s place in our society, about who is (and isn’t) writing the code that runs our lives, why that matters, and how to fix it. Dorothea Salo teaches a course called “Code and Power,” which looks like a fantastic course, from the syllabus (which, yes, I mined for ideas). I want to share the readings I’m planning to assign for the “critical perspectives” portion of my class. (Bill’s readings overlap with mine, but we did make a few different decisions.) I’m open to suggestion on swapping some of these out for newer/better options, beyond the first week’s worth, which I’ve already assigned. It’s worth noting that each student has made a 5-minute video for their peers, and some of those dealt with social aspects of computing, too. 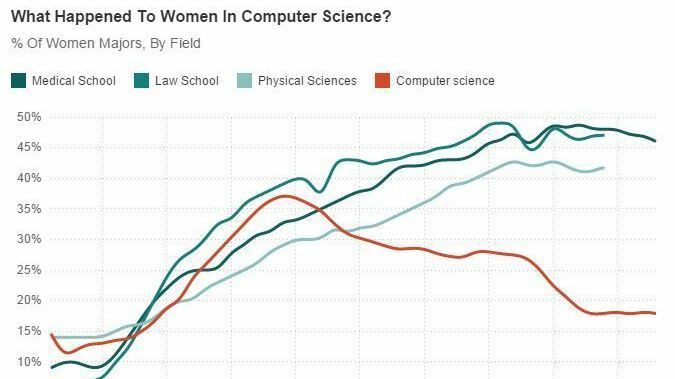 There was one on impostor syndrome and the Dunning-Kruger effect, one on gender and computing (which also mentioned GamerGate), one on algorithmic bias, and one on mental health and computing (though that one has not been shared yet).